Fine you win by virtue of impeccable logic and deep insight into the human condition; not to mention a finely honed knowledge of microeconomics and history. I quit. Everything. I declare myself an old workhorse that can no longer pull the plow. Sign me up! I want my 5 cents from everyone so I can have a fulfilling life for my remaining years. I'm going to pass the word around to all the other workhorses I know. I will encourage them to teach their children to not be workhorses. We will all live off others people's money. It's really funny that you called me out on that because that's exactly what that passage means. Dead on. He's talking about the spiritual economy; basically saying anyone who repents and accepts Jesus gets to go to Jesus-Land even if at the last minute. BUT, I absolutely love using it as an economic metaphor because I truly think one of our major problems is people looking over other people's shoulders and griping about what they're getting. The cost of capitalism is too damn high and really all it does is pay off rich people, enslave the poor to strike fear in the middle class, and funnel wealth upwards, so... as a dutiful thrifty capitalist I'd like to buy a better system please. Yes, a better metaphor Jesus could have used is in the minting of a sovereign coin (or monetary instrument). Some 'coins' derive their value from the hard labor of millions of people through taxation on their sweat and suffering. Other sovereigns gain their value from borrowing capital from a more powerful economic entity who can bear the dilution (Jesus' Kingdom he claimed). Either way, the sovereign coin is stamped with the image and trust of the sovereign itself (The Seal of the Sovereign), and is registered as equal currency. The strength of the sovereign is used as the capital backing - and not simply the tally of total labor and sweat on the part of the populace. But if nobody in the nation provides value, this is simply a trick to enrich the ministers of that nation which does this. This happens over and over and over in socialist nations. I map these declines in my case studies to nations I work with. Which brings us to the present day. You must understand that accrual of wealth to the elite ranks is a socialist, not a capitalist activity (although this process may start inside capitalist activity at first). Capital is not wealth. Capital (M1 and M0) is money which is burdened with the task of 1. Velocity and 2. Return. In other words, justifying its keep. Wealth (M3 and M2) never justifies itself - it just sits and pretends as if it were the sovereign 'Kingdom of Heaven' on Earth (an imitation of God in this role) - the unlimited source of immediate value. This is why royalty and socialism have presided hand in hand as secret partners over the last 4500 years of human suffering and failure. They are the same thing. Wealthy elites entertaining themselves at how well they can help the 'underprivileged'. All this does is kill value, kill capital, kill human dignity. False gods on Earth... always = human suffering. The reintroduction of socialist collapse. You will notice historically that the consolidation of money into few hands usually presages a war in which a global-aspiration socialist entity must be defeated, and then prosperity re-ensues. This is not a coincidence. Never forget that everyone you meet is a fractal of god. Including yourself. There is something to be learned from every person on this Earth and no one has the right to decide who lives and who dies. We are here as stewards of the earth and of each other's dignity, autonomy, and the preservation of as much as freedom can allow before it starts infringing on others. Dividing ourselves further is not working. I have started and built 8 companies now - and I ran them all this way. It was just a blast to work like that. I have several more businesses in the works but I cannot get capital for that sized business - because these businesses are reserved for the Crony Class only. They will not let a low life like me, develop these good ideas and threaten their wealth hold. From my experience with the Crony Crowd, up close and personal... they get joy out of deception and taking advantage of people. $20 Billion is not enough for them... they want more, and they use their connections to get more. And yet, still get a giggle out of screwing an employee for $1,000 through a bit of 'ha! I outsmarted you!' sleight-of-hand. yeah man. that's it! it's a great vision. Never forget that everyone you meet is a fractal of god. Including yourself. That is a religious belief, not a fact. There is not a shred of evidence of such god. Your statement also denies the individuality and uniqueness of human beings. 4. Every material need simply appears in a little cubby hole in your quarters. 9. Alcohol intoxicates but does not dull senses nor give a hangover. Addicts don't exist. 11. There are no taxes, medicine can fix any malady known to man, and is just down the hall from you and the doctor wants to just work 24 hours a day with no pay, retirement, convalescence nor children to care about. 12. Your weapons can outmatch anyone in the galaxy. There is no mafia, no cartels, and no Bolshevism. 14. Nothing needs maintenance, nothing breaks down. No one ages or has any pain. 16. Enemies are always goof-balls and exhibit the worst of humanity. 26. Nobody questions reality and everyone knows exactly what death is, and is not afraid of it. 27. Everyone you encounter, lives in exactly the same circumstances as do you, recognizes you as an authority upon first meeting, all think like you do, and only have one human-flaw at a time - a flaw with which for some reason, you are intimately familiar, despite that human-flaw not ever having existed in your reality at all. Give me all these miracles - and YES, socialism will work. In fact ANY-ISM will work in this environment. Pardon me for interrupting a good argument while the feathers are still flying, but I wonder if you recognize points that you have in agreement? Curiously, you both seem to see yourselves as victims of the same Capitalist system, whether through paying too much taxes; or through the wealth not being spread far and wide enough. You both don't disagree that our economic system is a belief in "progress" based on "competition" which creates "winners" and "losers" - Social Darwinism. As for the character, race or religion arguments, you do realize that no man-made political or economic system can change our basic human nature - whether Socialism or Capitalism ? You don't disagree that our economic system is a belief in "progress" based on "competition" which creates "winners" and "losers" - Social Darwinism. First off, everyone has a right to gripe, don't they? Capitalism does involve social Darwinism. I agree. It maximizes production and value given the flawed nature of humans. Socialism/Communism rely on a new kind of man being created - which ain't gonna happen and which is why they fail (or one of the big reasons). Our system of capitalism is not a *belief* in progress like socialism is a cultish belief. Capitalism is demonstrated to have resulted in material progress - whereas socialism has the opposite result. You can talk about spiritual development versus material all you want, but I think most people greatly underestimate the material,physical and emotional pain and suffering that the average person used to experience due to pre-industrial/pre-capitalism lack of material development. For crying out loud, even the wealthiest women used to die all the time in childbirth. Diseases took their children on a regular basis. Death and loss were everywhere. ... Even the "losers" are much better off today than many winners were a mere 150 years ago when capitalism was in its infancy. Capitalism is most definitely a tide that raises all boats. Too many people get caught up in jealousy of the top winners. And, as I said previously, it is ignorant to hold that if someone has a lot then others must have little. I repeat that there is not a finite amount of money (=value). I don't see myself as a victim of taxes or anything else. I'm am literally explaining the microeconomic decision I will make if socialists take over and want more out of me. I will quit being a producer and become a taker. That is the rational choice, despite Gamey's decree that it is my cosmic destiny to be a "workhorse" = LOL - that's the only way his simpleton scheme has the remotest chance of working. If I am fated to be a Jungian archetype/ AKA a slave for my saggy pants plantation owners. I guess I have it coming because "The Man" has somehow beaten on saggy pants- the poor thing has no agency at all :-( - and Saggy is owed reparations and a victorious revolution or some stupid Marxist crap like that. I think it's funny that cubicle guy is schooling me on the conditions of life for Saggy like he'd know anything about it. More fantasy on his part. Not worth talking to because not grounded in reality or deciplined rational discourse. "But if you live in the real world, you have to be smarter, more ethical and better.... Capitalism..... "
An equal strawman can be built against capitalism, but that is not an interesting avenue of argument for me. However, not trying to derail this discussion, I humbly suggest you deeply look into the discussion/differences between capitalism vs free markets vs unconstrained competition. They are not the same, nor do we have real world pure examples of any of these in real human societies (all have capital restrictions, market restrictions and competition restrictions). What about fusing Libertarianism (individuality) and Socialism (communality) to get Libertarian Socialism as the end result? 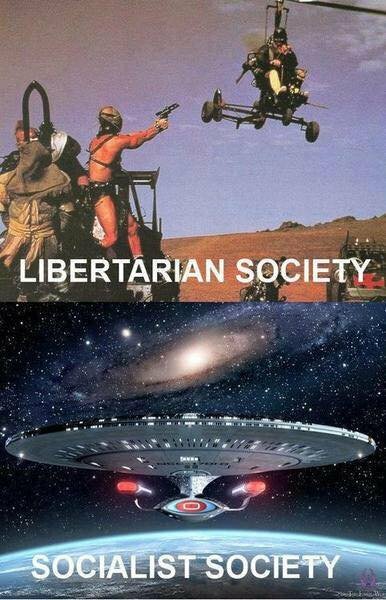 Libertarianism completely without Socialism will turn into a dog-eats-dog pepetual social war. Socialism completely without Libertarianism will become an oppressive, censorious, punitve tyranny. We have to find some way to combine them - humans are both the most individual and most communal beings. Denying one part of human nature to absolutise another is simply no way forward. One begins to detect not bias, rather agency. I don't know, having spoken to Steven Novella on several different occasions I always pegged him more as a useful idiot... a very smart and personable one, but with enough of an ego to be directed. Sorry but I can't find it. heard it on the Corbett report. I get yr points and am enjoying the back and forth, but would ask that you stay topic with lots of facts/data and avoid personal questions/jabs. makes for a better read... and it better forum vibe. yeah, but don't you think there's a "don't blame the player, blame the game" aspect to this. we've created a system that is winnable for lots of people, maybe not for everyone, but for more people than anyone in history. it would be nice if the system had a better interface with the spiritual path but from my experience it doesn't. Forgive me. Please replace the word "God" with "humanity" or "consciousness". It's all the same to me. Every person you meet is a fractal fragment of humanity. Every person you meet can teach you something about yourself. I would also wager that were I to take your "essence" (soul as some might say?) and place it into baggy pants man before he was born - and you were raised in the same genetic pool, in the same environment, in the same neighborhood - I would wager that you would BE baggy pants man. There's no doubt in my mind. I personally don't want a government that is afraid of its people. People who are afraid do stupid things and often lash out. I'd prefer a government that WAS its people. Bhagavad Gita = religious text. We are not a great melting pot, a collective. We are individuals, and always have been and always will be, for infinity.